Practice the concepts of Mixed Caselets at MBA section of jagranjosh.com to ace the Quantitative aptitude section. Prepare well for your CAT, CMAT, MAT, XAT, IIFT, SNAP etc exams. Questions on mixed caselets are often seen in the CAT Exam and other important management entrances as well. These questions are important not just for the quantitative aptitude section but also for the Data Interpretation Section as well. Practice the question on Mixed Caselets in order to get a good percentile in your targeted management exam. Directions for questions (1 to 5): Answer the questions based on the following bar graph and the adjoining table. 1. What is the Simple Annual Growth Rate (SAGR) in China’s total exports to the India from 2008 to 2013? 2. What was the approximate size of Indian market (in million dollar) in 2013? 3. 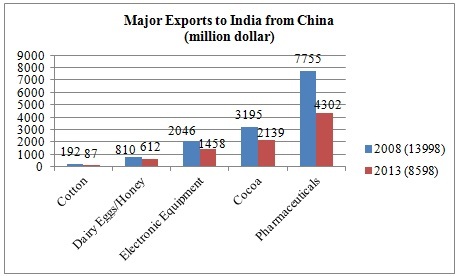 What was the size of the Cocoa market in the India (in million dollars) in 2008? 4. Which of the following products showed the maximum percentage increase in export during the given period? 5. 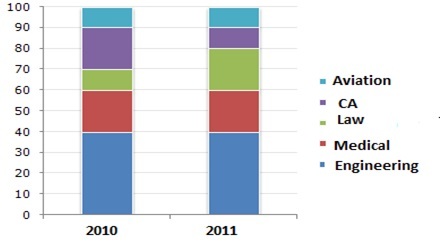 What is the ratio of exports of pharmaceuticals from china in 2013 to that of electronic equipment in both the years? The below table shows the ratio of male and females in year 2010 and 2011. 6. If the Female student’s opted medical in 2010 is 3600, then approximately what percent are the male opted engineering as career option in 2010? 9. What is the respective ratio of males who studied law in 2010 and females studied CA in 2011 if the total strength in 2010 is 15,000 and increases at the rate of 10% in the next year? 10. If the number of students enrolled in 2010 and 2011 remain same as in question 49, then total number of students in Medical, engineering and aviation in 2011 is approximately what percent of total strength of 2010? In this section we will explain the rationale for choosing the answer pertaining to every question. After practicing these MCQ(s), you would be able to understand the concepts of Mixed Caselets. Explanation (4): Cotton is the obvious answer because its share went up more than twice. Hence answer is (c).